In the garden of the hotel Bedřiška is situated the depandancy, which is about 50 m far from the main building and which is connected with the hotel with a illuminated pavement. The whole hotel komplex find itself cca 8 min. far by walk from the town centre and from the sportsareas cca 10 min. by walk or you can use the skibus, which is free of charge and the sibus stop is directly by the hotel. The hotel Olympie stand in Špindlerův Mlýn, in part of the town called Svatý Petr. The hotel was completely reconstructed in the year 2000. His reconstruction and modernisation brought the improvement of the hotel services. The sportsarea Svatý Petr is situated cca 5 - 10 min. far from the hotel or in the winterseason is disposal to you the SKIBUS. The skibus stop find itself cca 100 m from hotel. The hotel is approximately 15 - 20 far from the center of the town. Hotel ALPINA*** is located at the wonderful nature of Krkonoše National Park at the very heart of Krkonoše Mountains – in Špindlerův Mlýn. The hotel is only ten minutes walking distance from the city centre. Hotel was reconstructed and renovated in the year 2004 in the manner corresponding with the European standard. The hotel can offer you the accommodation from single one up to four-bed rooms. All rooms are equipped with WC, shower or bathtub, Tv-sat and in some of them is possible internet connection. Before pension Martin, now hotel Martin stand in a charming corner of the Giant Mountains in the valley Svatý Petr in Špindlerův Mlýn. This stylish building with a pleasant atmosphere is suitable mainly for a quiet family holiday. From the center of the town is the hotel Martin situated approximately 10 - 15 min. far by walk. Near the hotel (cca 8 min. far by walk) find itself the biggest sportsarea in Špindlerův Mlýn - Svatý Petr. The hotel Kristýna find itself in a calm part of Špindlerův Mlýn in the valley of Svatý Petr. The way to the center of the town takes you approximately 10 - 15 min. by walk. Near the hotel is situated the biggest sportsarea Svatý Petr (cca 8 min. far by walk). Of course you can go in the both of sportsareas with the skibus, in the winterseason free of charge. The skibus stop you will find cca 50 m from hotel. Hotel Barbora was built in 1991 in a modern style, is situated in the center. From the hotel is a beautiful view of the town and of the ski slopes of the near-by ski resorts Svatý Petr and Medvědín, of the city and the adjacent peaks of mountains. The sport resorts Sv. Petr is about 8 – 10 min. and Medvědín is about 15 minutes walking distance far from the hotel or you can use a ski bus which bus stop is near from the hotel. Hotel Windsor occurs in the town centre of Spindleruv Mlyn. It offers a beautiful view on the neighbourhood. The distance of the sportsarea Svaty Petr is cca 8 - 10 min. by walk and of the sportsarea Medvedin cca 15 min. by walk. But you can take for the transport in both of sportsareas the skibus (in the winterseason free of charge), the skibus stop you will find near the hotel. The hotel Zátiší find itself in a calm part of Špindlerův Mlýn – in the valley of Svatý Petr. The majority of our guests return regularly to us. the hotel is characterized by its fine taste and feeling for a cosy environment and rest, with unobtrusive and decent service and with our marvellous cooking. The way to the center of the town takes you approximately 10 – 15 min. by walk. You find us in the picturesque St. Peter valley at 950 meters above sea level. 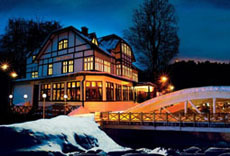 Hotel is situated 2 km from the centre of Špindlerův Mlýn, 500 m from the sport and ski area St. Peter. There are two small ski lifts for the beginners just next to the hotel. Hotel Pod Jasany is situated in Špindlerův Mlýn, 900 m above sea level, on a calm place about 10 min. walking distance from the town centre. The hotel was refurbished in year 2002 and offers accommodation of a high standard. To the ski area St. Petr is about 20 min on foot or you can get there by ski bus which runs in the winter season for free. From the ski area Medvědín is about 300 metres. From the hotel there are beautiful views of the ski slopes and of the mountains. Hotel Westend***+ is located in a beautiful countryside of the Giant Mountains right in the centre of Špindlerův Mlýn. The hotel was part of the hotel complex Savoy before it made itself independent. The The ideal position of the hotel together with its interior facilities ranks the hotel high among others. Ski bus station is about 50 m from the hotel. Ski lift Hromovka is about 100 m.
Hotel Styl *** is placed in Špindlerův Mlýn, close to Labská přehrada (Elbe Dam) which is the most highly situated dam on the Elbe river. If you're looking for a hotel in the Czech Republic to spend your holidays at, look no further! Hotel Styl*** is your best choice. Hotel Styl *** has a perfect starting location for both summer hiking or cycling and winter ski running along the mountain ridges in Krkonoše. It takes about 15 - 20 minutes to walk slowly to the city centre of Špindlerův Mlýn. You can use the hotel shuttle bus as well for your better comfort. Ski area Labská is located just 5 minutes walking from the hotel. 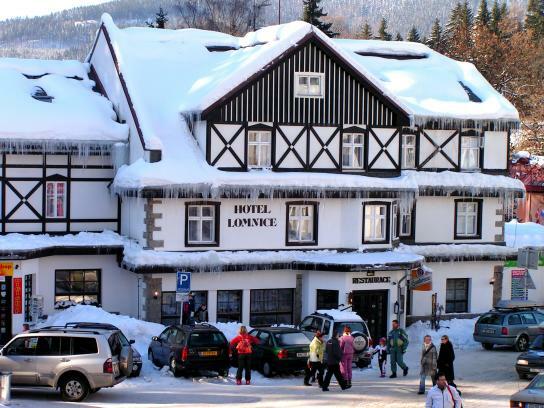 The Lomnice Hotel is situated dicectly in the centre of the well-known resort of Špindlerův Mlýn. Post offices, shops, ski and mountain bike lending offices and a taxi rank are very close to the hotel. The hotel lies on the way to Svatý Petr the biggest winter sports centre in the Giant Mountains. The ski bus station is directly by the house.